I have wanted pink hair ever since I was a little girl and saw the movie Grease. Remember when Frenchy messed up in beauty school and ended up with pink hair? I thought it looked AMAZING and have wanted to dye my own locks that color ever since. Cut to 20 years later (gosh, has it been *that* long? yikes!) and I finally did it. I actually bought all the dye stuff months ago, but didn’t get up the courage to go through with it until now. It’s silly. It’s just hair! 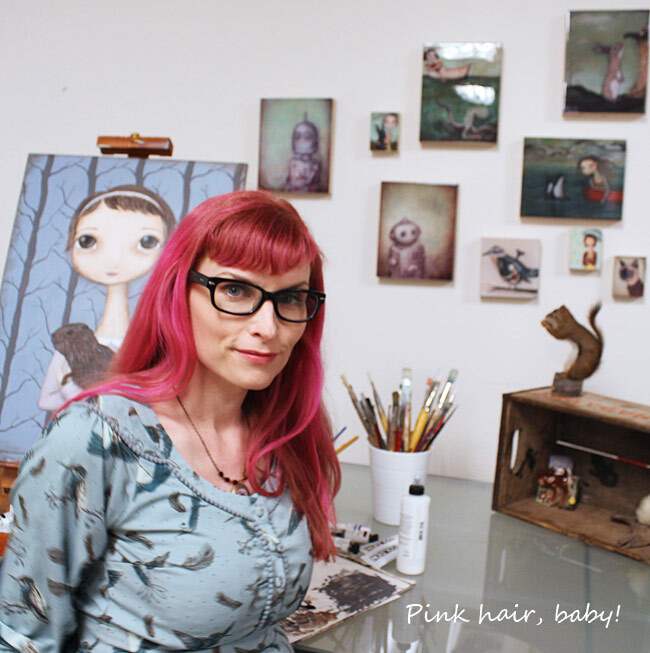 I don’t know what I was so afraid of, but as soon as I saw it, of course I wished I hadn’t waited so long to go pink! Speaking of things I’m afraid of, the reason my studio is looking so sparkly clean in the photo above is because I had a TV crew interview me for a little segment on MyVancouver – a local show on the Telus Optik network. It will only be a 4 minute segment, but they were at my studio for over 3 hours. That? That is my nightmare! I’m leaps and bounds better than when I was a kid, but I’m still an introvert and quite shy. So the idea of being interviewed in HD video was absolutely terrifying. I even managed to give myself the flu to postpone the whole thing. But yesterday I sucked it up, faced my fears and did it anyway. Woohoo! High fives & happy dances all around!! The thing is, once I was there & the cameras were rolling, I was fine. Nervous, sure, but it wasn’t live. I could stop & re-do my answer if I needed to. The editors will more than likely edit out all of my ummms & uhhhhhhs. And I’ll get to have (or at least link to) a professionally made video showing off my studio and my art. How cool is that??? Is there anything you’ve been putting off out of fear? Do you have a special trick that helps you feel the fear and “do it anyway”? I’d love to hear about it in the comments below.